First off, let me start by saying thanks for such a great community. I have been browsing the forums for about a month or two while I try to convince the wife that home automation is more than just a toy! (Ok a bit of a toy but still more) Before I go into buying a whole bunch of stuff, I wanted to make sure that what I was planning on buying is what I need and not redundant. A few door and window sensors to see who is coming and going and what windows are open. A Schlage Camelot Deadbolt for the door we use most. If the window is open, then NEST: do not turn on the heat or AC no matter the interior temp. Obviously to keep from heating the home when the wind was left open. With the wall plates, any bulb can be used, correct? it is the wall plate turning on and off, not the bulb. So the ceiling fans can take regular bulbs (or normal LED bulbs) with no need for a smart bulb. If this is the case, then it is sometimes cheaper to use a wall plate for like a pair of floodlights than to have smart bulbs put into these sockets. With the wall plate, I should be able to tell Echo, “Turn on dining room light” and it should work. Or use IFTTT to says, “If female marriage partner leaves for place that makes the money for all these things AND it is after 6:00am, then turn off all lights and lock the door” “If child that uses all the money we make comes home from school, send notification of entry and turn on desk lamp for homework”, correct? What is the range of signal for a HUB? My house is by no means large, about 1700sqft, so if I have to control something across the house, it should not be a problem right? (I do have a problem with wifi signal reaching strongly across the whole home. We have cats, is the motion sensors going to go haywire every time they move? I would like to have control like: If the wife comes home at 9:00pm, turn on the driveway floodlight, the back door light, the kitchen light, unlock the back door, and set the temperature to 70 degrees. Can this all be done with the things I am looking at getting? From what I read, the only hitch to that may be the temperature control with Nest. So I guess long and short of it… Am I on the right track with both the plan for the setup and equipment? Again, thanks for all the help before I pull the trigger! Pretty much everything on your device list is officially supported but for the Nest. Community written device type does exist. Experts can confirm. As my personal opinion if you are getting some hues, I would suggest getting the hue bridge as it is the recommended way. My house is nearly the same size as yours and may be much older (late sixties) and for me zigbee/zwave mesh has not been an issue but YMMV. I am addicted and have too many repeaters etc. for such a small house. I was looking for the great topic regarding interference and placement of hubs etc. but too lazy to find it. @JDRoberts has it always at the top of his head! Don’t have time for a long answer right now just a couple quick points. The Hue Lux line is being discontinued in late November/early December and being replaced with a new line, “hue white.” That hue whites are 33% brighter and 50% cheaper then the hue lux, which makes the decision to go with them much easier. They should retail for about $15 at regular price. The GE’s retail for about $13, although you can sometimes get them on sale for 12. The Phillips is a much better bulb, so I would go with those over the GE. And the echo is great! Welcome, and it sounds like a well thought out plan. I’ll echo Ron’s comments and add two of my own. The Nest thermostat works great with the custom device type written by @Dianoga. If you happen to be replacing a Kwikset deadbolt with the Schlage Camelot, be aware that they are not a bolt-on replacement (don’t ask how I know). The bolt is shaped different and longer, and the mortise depth is different. If you are handy with a chisel and router, you’ll be okay. Otherwise, plan on hiring a locksmith or finish carpenter to do the work (a 5 minute job with the right tools and template). My house is also approximately that size, spread over two floors. I have no coverage issues. I like the plan, the only thing I’d say is, don’t make a plan. Start with the hub and get a couple of things then go from there. Welcome to a long and dark path of HA addiction! Plans are just that, plans. Get a hub, but a bunch of stuff and set it up. Then buy more stiff, set that up. Then buy more stuff, set that up… Repeat indefinitely. The only plan is to buy more stuff! Oh, and I hope you aren’t on FB… As this forum well replace that little social nightmare! As far as the cats, there are “pet immune” motion sensors which will generally ignore anything under about 20 pounds. Not perfect, but they do reduce a lot of the false alarms. But you have to look for that specific feature. THANK YOU all for your tips… I really do appreciate it. Do you think that a Smartthings Hub and/or any of the Things will go on Blackfriday or XMas sale? If so, where is the best store to look for these deals? What about chances the Echo will go back to $99? Is there a indoor or outdoor that is a good value for your bucks? I know Samsung makes one and so does nest. Any recommendation of other and are they all pretty much the same? Sorry, “indoor or outdoor” what? As far as sales, no way to tell. My guess would be the most likely sales would be a kit that goes on sale at either Sears or Best Buy. I do think it likely the echo will go on sale at least one more Time for the holiday season, but you never know. It’s also going to be sold in some retail stores, I know Staples is going to carry it. So there might be a sale there at some point. Sorry… Indoor/Outdoor Camera. Thinking about a front door solution and maybe even a solution to check in on the interior of the home while away. Just not sure if it is in the very limited budget right now. JD… Awesome write up… Seriously, nice work. It was a huge help! I am looking at wall switches to control ceiling lights with multiple bulbs. It may be cheaper to do these lights on a switch than replace each bulb with a smart bulb. However, items like the smart switches made by GE and sold on the Smartthings site are $48-$58 per switch. Anyone know of a reliable place for cheaper products? At that price, and with the cheaper price per bulb of the GE Link or Hue White, it may be no cost savings going with a wall switch. Can a wall switch turn on the lights if someone flips the switch off? If so, that is the main advantage I see. With now, if I use bulbs, the lights pretty much have to be turned off using the App/Hub/Echo. I did see these: http://www.monoprice.com/product?p_id=11989 on monoprice. However, I am not sure that I want to try to jam that thing in a box. Anyone set these things, from monoprice, up and how hard are they to install and do they work? I started out with bulbs because of the cost point. It’s just cheaper! But I quickly realized that in some areas it’s just better to go with a smart switch, and I realized this after the first visit from the in-laws. I was constantly resetting everything! After I figured out which switches were off… Total nightmare. So, in places like the living room lamps, I kept the hue bulbs. Sometimes I want it bright, sometimes not. So the bulbs make sense, plus they are lamps and they are placed where they aren’t easily reached. Ceiling fans, dining room, hall, foyer, kids rooms, house baths, all are getting switches. I’m pulling around 30 bulbs (anybody want to buy a bunch of GE link bulbs?). The switches also keep my app less cluttered and make it easier to track. But the best benefit of a switch over a bulb… If the switch turns off the lights, it doesn’t matter! The app and echo can still control them! And, if the power goes out, my house doesn’t light up like a disco! (Bulbs reset at 100% after a power loss). So, even with the extra cost it is beneficial for me and my family likes it better. They don’t have to worry about going around and resetting dumb switches. But, in the end it is up to you for your preference. With more convenience comes more cost, usually. Oh yeah, I have 5 bulbs in the kitchen that I was going to replace with switches. But the wife was adamantly against that. She loves the control over each bulb in there. So, don’t just go with your preference. I recommend you give the pros and cons to the family and see what they want too, cause they are either going to embrace it, or you’re going to be fixing stuff because they hate using Alexa or the app. Thanks for the quick reply. That is EXACTLY what I was thinking. I bought 3 more GE Link bulbs on a whim, but I got to thinking about it and realizing how cluttered my HUB control would be if I add 50 individual bulbs. Plus, the wife is NOT going to want to open her phone every time she wants to turn a light on or off. So I will use the Link bulbs for lamps not on a wall switch BUT switches for everything else. Just means that I have to find a cheaper way to do it. I would need 10-12 switches BUT the wife has given me a total allowance of about $500-$600 for my entire project. 10 GE switches would blow this out right from the start. So I got to find a way to get the switches for cheaper. I’ve personally only used the GE/jasco switches. I try to stick with the same brand for similar device types. Don’t forget about echo. She’s wonderful for lighting. That’s a very good integration with ST. I have three in my house. Plus, it does so much more than turning on the lights. It is a really powerful tool. LOL, I already walk around the house going, “Alexa, turn on living room light” Then I look at the light, look at the wife, look at the light, grumble and get up to turn on the light. I figure that if I do it enough, the wife will let me buy a Echo just to shut me up! I REALLY wish I would have decided to do this when they were $99 and I would have bought one for the bedroom too. But as it stands, I am waiting to see how low they go over the holidays to pull the trigger on on (maybe 2 if they go to $125 each). Can the Hue Hub see these switches and control them, or do they NEED a Smartthings Hub? GoControl is not an “off brand” in the Zwave world. Instead, they are one of several brands made by one of the largest Zwave device manufacturers, Nortek. Nortek also makes two gig, linear, and some of the Nutone devices. The different Nortek brands are aimed at different market niches. Linear is mostly aimed at professional installers. Gocontrol is the DIY brand. Two gig is a little bit higher end then Linear. Often these are exactly the same device just rebranded. The “GE” switches are actually manufactured by jasco, but they licensed the GE name because it goes over well with consumers. These are some of the cheapest switches you can buy and they have one of the highest failure rates and shortest warranty periods. They also have fewer zwave features than many of the other brands. They’re strictly a basics brand. But still very popular, because they’re so cheap. So which brand you get is always a personal decision based on your budget and whether you need any of the advanced features. The GE switches use an older design which requires physical traveler wires between three way switches, for example. Most of the medium cost and higher cost Zwave switches use wireless 3 ways only, which gives you a few more options with regard to switch placement. Again, there’s nothing wrong with going with all GE switches, just understand that you’re choosing a bargain brand, usually on a cost basis. In terms of engineering quality from highest to lowest, the big Z Wave brands are probably Cooper, Leviton Vizia, Leviton D Series, linear (all brands), evolve, Dragontech, GE, Enerwave. Only the Cooper and Leviton offer instant status update, for example. check the length of warranty on each, it will tell you a lot. Cooper may be listed as either a “Cooper”, “cooper aspire” or “Aspire.” They’re all the same models. But people choose switches for all different kinds of reasons. Some people prefer blue LEDs to green LEDs and that’s enough to make a preference. There are several forum topics were people share opinions about different zwave switch brands. But again, different people like different ones. Personally, because I’m quadriparetic and can’t do a lot of tinkering, I prefer to put more money into the switch upfront and get something which is better engineered, will last longer, and is less likely to require that I run around to the switchbox and throw the breaker in order to get it to reconnect to the network (a known problem with GE switches). But that’s just my requirements. 10 years ago before the wheelchair thing I probably would’ve been very happy with the GE switches, you can save a lot of money with those. By the way, we have a deals thread in the forum where people list good deals, and switches are frequently there. Right now as it happens Iris, which is the Lowe’s house brand, is switching from one generation to another and consequently they are marking down a lot of devices in the old boxes. That includes a bunch of GE switches, and people have been able to get them locally for as little as 10 or $15. So you might take a look at the Deals thread just to see how that works. Does the Switch Need a Neutral? It’s also very important to understand what kind of bulbs work with which switches. 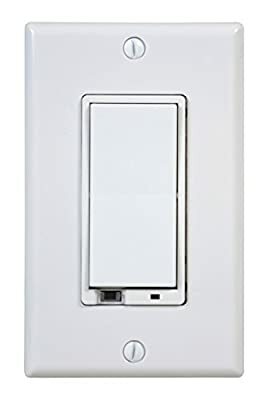 Switches which do not require a neutral, which include some models of GE and some models of Cooper, will typically only work really well with incandescents and some dimmable LEDs. They may have problems with other dimmable LEDs and CFL’s. But then the other switches do require a neutral. So you need to know which models you’re ordering and whether they fit both your wiring and the bulbs you intend to use. I want to start connecting some recessed lights to smartthings...just curious what approach is better. Using a standard dimmer switch with connected lights or using a z wave switch and regular lights? You need the SmartThings hub or another zwave controller for the switches. The Hue bulbs are Zigbee, a different protocol. Wealth of information and thank you so much. I was looking for a deals thread or section but did not come across it until you linked, so again THANK YOU. As for your info on switch brands, I would have never anticipated that GE would be the low end. Especially since the ones I linked to were cheaper than most of the GE ones. I do not mind spending a bit more money for something that is going to last longer than 3-4 years. I would like to get 5+ years out of anything I install.